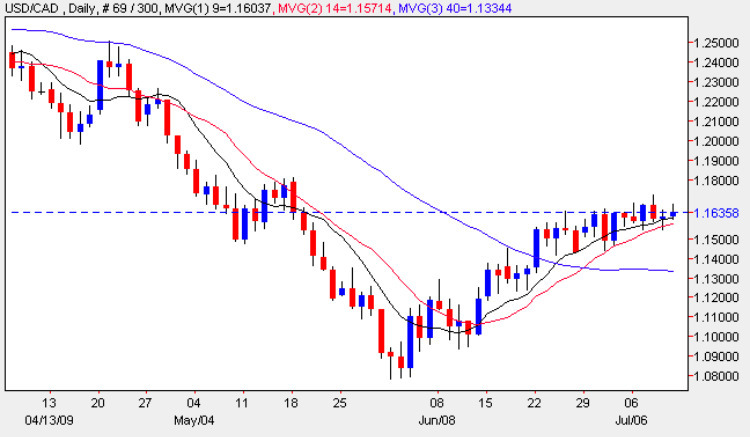 The past two weeks for the USD/CAD has been characterized by a series of narrow spread trading days resulting in a collection of spinning tops and doji candles, of which yesterday was yet another example in this sideways consolidation. Having said that the trend does have a marginally bullish bias as the low of the day found support from the 14 day moving average and with the close of the day resting lightly on the 9 day moving average, both signals of a move that is likely to continue higher. However, as we creep up the chart we have still failed to clear the resistance at 1.175 and only a break and hold above this handle will open the way to a re-test of the 1.20 price point. All the items of fundamental news on the economic calendar for the US can be found on the main Eurodollar site while for Canada we have had the Employment Change coming in better than expected at -7.4 against a forecast of -34.6 and the unemployment rate, again better than expected at 8.6% against a forecast of 8.7%, but nevertheless showing an increase month on month to the overall figures. The trade balance, on the other hand, came in significantly worse than expected at -1.4bn against a forecast of -0.5bn with exports falling twice as fast as imports. This is Canada’s largest deficit since records began in 1971. Finally the fundamental news for Canada rounded off with the NHPI data which again was better than expected at -0.1% against a previous of -0.4% – this index measures the change in the selling price of new homes.